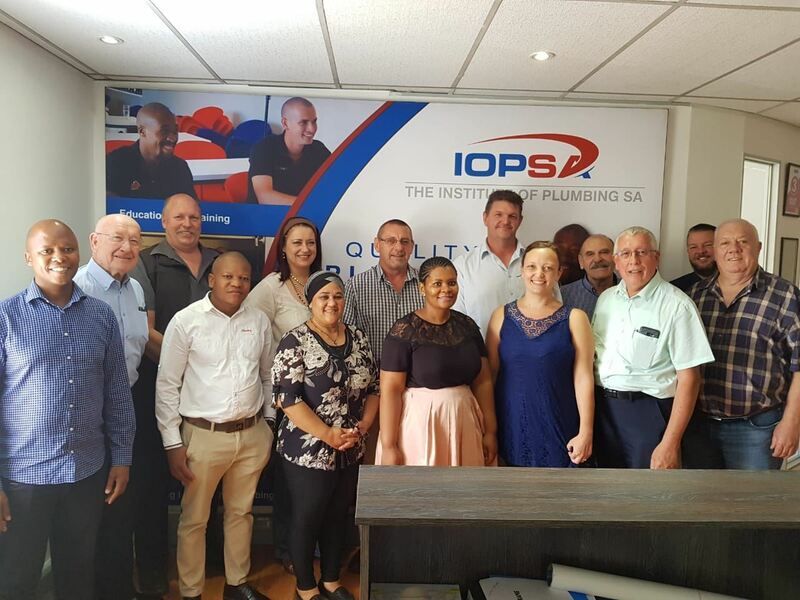 IOPSA has established a community of experts (CEP) in plumbing training to assist the QCTO to develop training programmes for entry level plumbing learners. This CEP met on the 19th and 25th of February at the IOPSA National office and compiled two programmes for submission to the QCTO. The one programme is called “Domestic water and drain repairer” at NFQ Level 2 and should be completed within two months. The second programme is called “The plumber’s hand” at NFQ level 3 and could be completed within 4-6 months. Although the defined policy guiding these developments has not been approved. This ground-breaking work has been completed to the highest standard and with the industries best interests at heart. Once through the internal processes the details will be shared with IOPSA members for input and comment. Watch this space and participate actively in the new developments for our industry and encourage quality plumbing for all. Skills development is central to the sustainability of plumbing as a relevant trade. We would like to draw your attention that the latest version of SANS 10252-1 2018 Edition 3.2 is now available. The new version of SANS 10252-1 mentions a few important changes and updates that you need to be aware of. We do however feel it important to bring a few of these important changes to your attention. All SANS standards for plastic polymer piping systems for hot and cold water supplies are approved for use inside buildings only. All plastics pipes used in hot and cold water installations near external doorways and windows, shall be protected from sunlight. Unlike metal pipes (steel and copper) that have generic pipe and fitting standards, thermoplastic pipe systems are required to be installed using the fittings and tools that are tested and approved as a complete system, The use of pipes, fittings and tools from other manufacturers or suppliers, that are not the same as the approved system, shall not be acceptable. Showers shall be of a type that can operate effectively at the internal water pressure recommended by the manufacturer. The maximum discharge flow rate shall be 10 L/min. 6.6.2.2 No flow control fitting of any sort other than a draining valve shall be installed direct in the pipeline between any fixed water heater and its associated expansion control valve or vacuum breaker. 6.7.5.7 Piping to be insulated includes all flow and return piping, cold water supply piping within 1 m of the connection to the heating or cooling system and pressure relief piping within 1 m of the connection to the heating or cooling system. Where possible lengths of pipe runs shall be minimized. 7.5.1.4.2 Maximum supply temperature Unless otherwise required, the temperature of water that discharges from any terminal water fitting supplied from a hot water installation shall not exceed 60 °C, however thermostatic mixers may be required to achieve a lower supply temperature. 8.4.6.5 Only water heaters or storage tanks of capacity ≤ 200 L shall be attached by means of brackets or hangers to a load-bearing masonry or concrete wall or to any other vertical structural element. Tanks and water heaters larger than 200 L shall not be wall mounted. 8.5.1.3 All pipework connected to, and all protective valves associated with, water heaters shall be connected by means of flush unions or similar connectors (such as caps and linings), to facilitate the replacement of such fittings. If compression fittings are used for this connection, sufficient provision shall be made for the pipework to be sprung, it shall not be between rigid fixed points. It shall not be required to cut the pipe to affect repair or removal or replacement of the component. 8.6.3.3 Pipes installed within a cavity dry wall shall be securely fixed. No pipe shall pass through concrete expansion or concrete joints, unless acceptable provisions have been made to the pipework for movement. 8.6.3.7 To prevent unwanted heat transfer, hot and cold water pipes shall not be laid against each other. Pipes chased and fixed in solid walls shall be at least 100 mm apart. Please note that this doesn’t include all the changes and therefore we strongly recommend that you purchase your own copy and familiarise yourself with the contents therein . This survey is meant for plumbing business owners. Even if you are not a member of IOPSA or are PIRB registered, you are invited to complete the survey. The survey will assist IOPSA and PIRB to better understand the context that plumbing businesses operate in. The results of this survey will be used to improve the service and support to the plumbing industry. We value your privacy and comply with all laws and regulations on data collection and will not use the information you provide to create any unfair advantage to any party. We acknowledge the funding support of the GIZ Skills for Green Economy project in this survey. There have been many technological advancements in the last century, but few as widely available and revolutionary as the mobile phone. Cell phones, and more recently smartphones, have become a truly integral part of our private and business lives. The small screen that holds hundreds of applications and resources for work and play assists us in almost every aspect of our lives. Today a mobile phone is an indispensable productivity tool and essential component of any tradesman’s toolkit. Few would disagree that good tools, fit for purpose and built to last, are an important investment. While almost any mainstream mobile device ticks all the boxes, they fall hopelessly short in the toolbox. Ever faster processors, increasing memory size and higher definition screens are all lost in a single drop to the floor – or worse, into water. It is this critical distinction that separates Cat phones from the rest. Have you ever come across a water-, drop- or dust-proof smartphone? The Cat phones range is all three – waterproof up to 3 metres, drop-proof from up to 1.8 metres and dust-proof too – certified IP68 and Mil Std 810G. Packed inside a rugged exterior, these smartphones run Android without compromising on processing power and storage. High definition Corning® Gorilla® Glass and sunlight readable screens, wet finger tracking and glove-on screen optimisation are standard, as are large batteries throughout the range. Led by the award-winning Cat S61, and packed with innovation, Cat phones are made for the construction sector and plumbing in particular. The Cat S61 elevates your business to the next level, unmatched in its ability to increase your service offering and earning potential. The integrated FLIR thermal imaging camera in the Cat S61 introduces powerful new revenue earning opportunities with thermal leak detection in full HD. Through the MyFLIR app on the Cat S61, you can take temperature measurements up to 400 degrees using any of the nine different viewing filters. The FLIR Tools Mobile app allows you to generate reports on site to share with clients or colleagues. Need to see water levels in a tank, or pipes in a wall or drains under the floor without chasing into the structure? It’s all taken care of – and so much more. The Cat S61 is IP68 & IP69K rated, so can withstand the blast of a high-pressure hose – a dip in the toilet cistern or geyser tray are no sweat for this workhorse. The Cat S61 also boasts a laser assisted distance measurement tool for estimating materials on the job – from piping to guttering, tiles to paint, you’ll measure surface areas or point to point distances while capturing photographs of the job at hand. The built-in indoor air quality monitor will assist by measuring the level of indoor air pollutants, VOC’s – alerting you to unhealthy air quality and keeping you aware of your work environment while keeping tabs on both temperature and humidity on site. The Cat S61 elevates your business to the next level, unmatched in its ability to increase your service offering and earning potential. When you’re next due for a mobile phone upgrade, consider upgrading your toolbox at the same time. Cat phones are available from all SA Mobile operators and supported with a 2-year warranty, free screen replacement throughout the warranty period and a free pick up and repair service nationwide. Customers have every right to do their research before hiring a plumber for their next project, and why not? It is their hard-earned money that is leaving their pockets after all. So, Plumbers hear questions like: Are you PIRB licensed? Is your company registered with IOPSA? Qualified? insured? Can you charge less for this? Do you quote free? Please clean up before leaving. The list goes on and on. Unfortunately for plumbers in South Africa, checking a consumer’s reliability is not so simple. Most of the time plumbers rely on their gut feeling and hope that the consumer won’t be too difficult or pay late. So how can plumbers avoid difficult customers early on so that they don’t end up pulling out their hair doing the job or grinding their teeth as they chase after money owed once the job is complete? We have put together a few tips to help plumbers avoid these situations. This is probably the best way to check if the customer calling for a quote respects your time or not. Quoting is a lengthy process. It takes time and money to travel all the way, inspect the job and settle over a quote. It’s only fair for a plumber to charge a call out fee. If a customer is not willing to pay a call out fee then they may not be serious about having the work done. For help calculating your call out fee, download the App Plumbers specifically designed to assist plumbers in calculating an accurate and fair call out fee. Download the app here. Of course if the work is not to standard and is incorrectly installed, consumers have every right to complain, but if someone is bad-mouthing the previous plumber and is speaking ill of them for no apparent reason, they will probably try to find faults in your work too. If your customer is too eager to get a discount or keeps on trying to negotiate a lower rate, this should ring a warning bell. You may need to insist on a deposit prior to commencing the job. You don’t want to get caught with someone who values price over quality and hard work. If you have done work for a client before and you had to wait for payment, the odds are good that they will do it to you again. Sometimes it is good to lose a customer who pays poorly. When you have been in the industry long enough, you develop a sixth sense. While trusting your gut feeling can be risky, it can be very necessary. Most of the time, a first meeting is all you will need to decide to work for the customer or not. The trick is to be very observant. Start with a checklist for yourself: Do they have a clear idea of what they need to get done? Are they realistic enough to know what timeframes are unrealistic? Are they complaining that the cost is too much? Watch out for those looking for continuous discounts. Your time is precious so use it wisely. Instead of spending an hour discussing high end finishes and extensive renovation plans only to later find out that their budget is for a basic installation, ask them about their budget first. Most of the time, the discussion will end there. Customers have the advantage of looking at their Plumbers licenses, certificates, work experience and so on, but Plumbers can do the same! Ask customers about the plumbers they have worked with before and call them to do a reference check, more than a few bad testimonials should be enough to ring an alarm. From the initial quotation where it is best to be as detailed as possible. Document when and how they are going to pay for the work done, who buys the material and how will the costing of extra work will be charged, get them to agree to all the terms in writing and have it signed by them before the work starts. If they disagree or try and negotiate too much, they will probably continue to do so throughout the job. 8. Ask them what aspect of work are they most focused on? If a customer doesn’t have realistic expectations, giving them charge of the project can prove to be a disaster. Let them tell you what they want but set the agenda yourself and walk them through the project scope, completion timeline, variations, materials and payment process. Ask them what matters the most to them. Quality, time or cost and you will be able to make an educated decision on the project going forward. 9. How many quotes have they requested already from other plumbers? If the customer has approached multiple other plumbers before getting a quote from you too, it can possibly show their priority is the price and not the quality of the job. 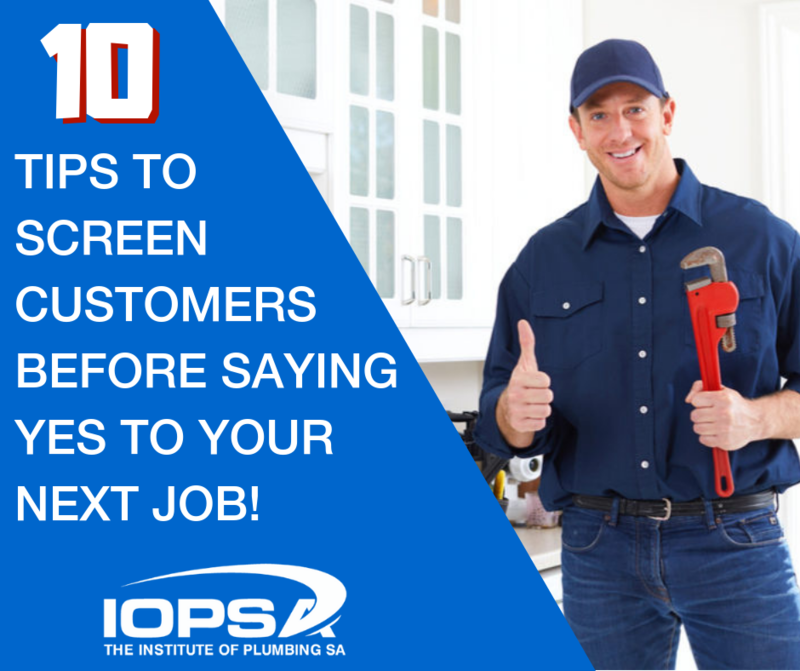 If a customer has called for a job, the plumber is under the impression that they want to get the job done. 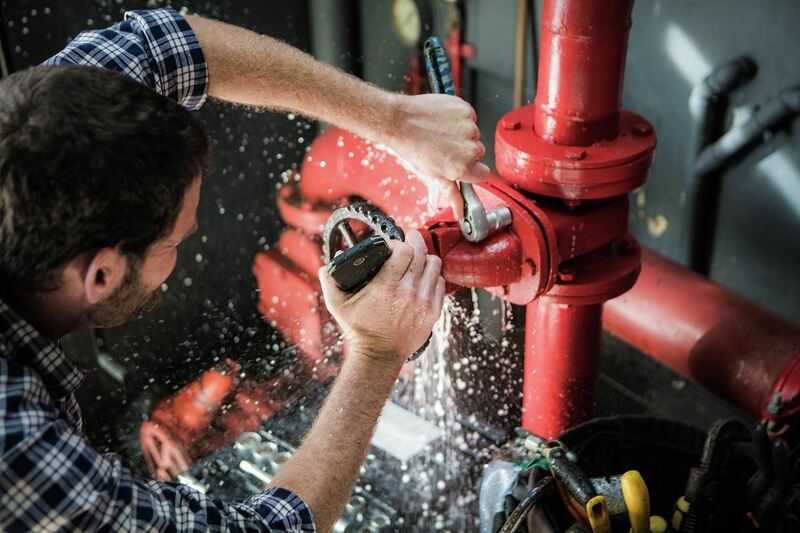 Respect for a plumber’s time is the number one rule for business. Are they calling for an emergency job that should have been done a long time ago? This may indicate a concern when it is time to pay for the job. Are they trying to suggest what the job should cost? They may understand the value of your skills. If you are new in the industry and have just started running your own business, you might bump into the wrong customers more often than you would like. But not all small businesses have the luxury to say no just because your gut tells you to. If time is on your side, be accommodating and patient. Take a few minutes to chat and laugh with them to see things from their eyes. But do your homework, before saying yes to your next job. On the 6th of November 2018, IOPSA's operations manager Steve Brown went to Just Domestic T/A Domestic Industries to offer some on site training and assistance on SANS 10254 and the logging of CoC's on the PIRB system. Team Domestic place on record our sincere appreciation and gratitude to you and IOPSA, for offering your valued service by empowering our team with the inter-active meeting session held this morning at the Domestic office. This was not only beneficial to the field team, but also to our administration team as well, as it assisted us to further understand the certificate of compliance logging and certificate of compliance installation. 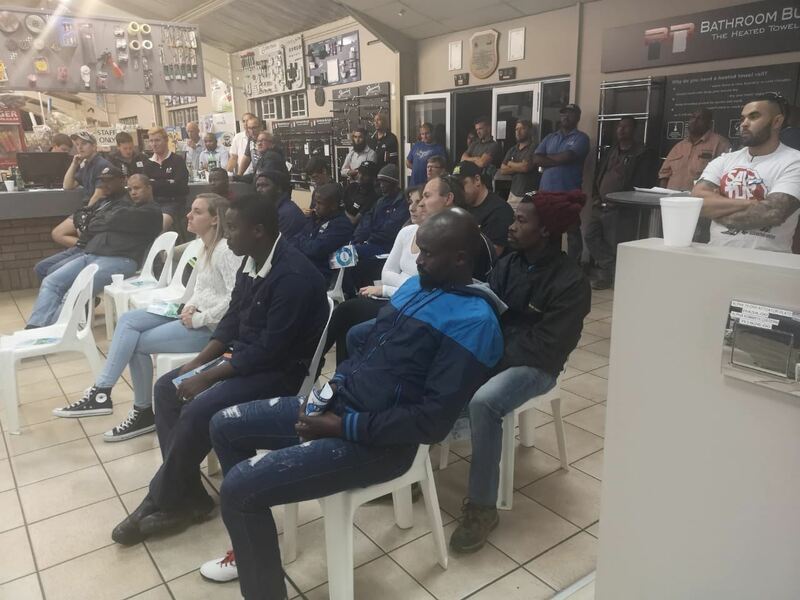 We pledge, as always, to work with you and deliver to our client’s optimum quality installations and service and to further our relationship with clients and IOPSA as ambassadors in the plumbing industry. Once again, we thank you for sharing your knowledge and look forward to more similar learning sessions. The survey was open to anyone to complete but the main communication channels were through IOPSA and PIRB. CPD points were made available for all PIRB registered respondents. More than 85% of the responses received were from PIRB registered plumbers and 35.9% of the respondents were from IOPSA members. Therefore the results could be seen as representing the views of the Formal Plumbing Sector. Other efforts are underway to gather input from the informal sector, but this is proving to be very challenging. The survey will be conducted annually by IOPSA in an effort to gain meaningful data and trends. As this is the first such survey there is no comparative data but in future there will be. The survey will be conducted in August each year. 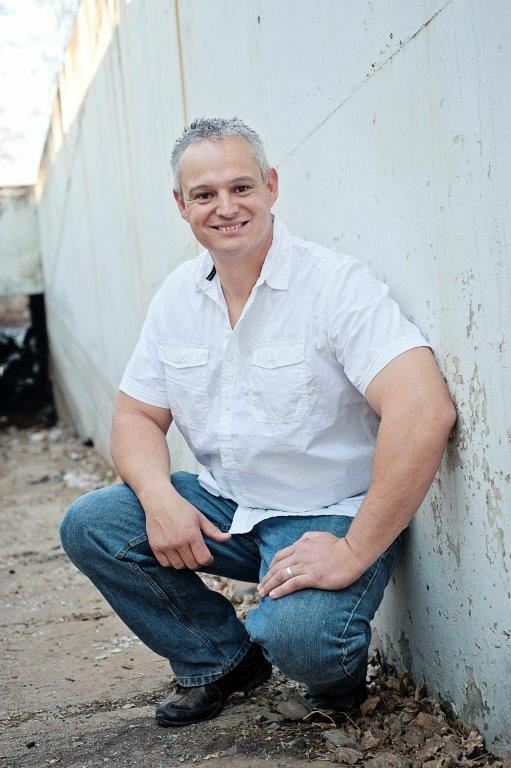 The Institute of Plumbing SA (IOPSA) is proud to announce the appointment of Steve van Zyl who will take over as the National Technical Manager, a role which has proven to be a crucial and much needed role within the industry. Steve started his career in 1992 as a filing clerk for SA Eagle. 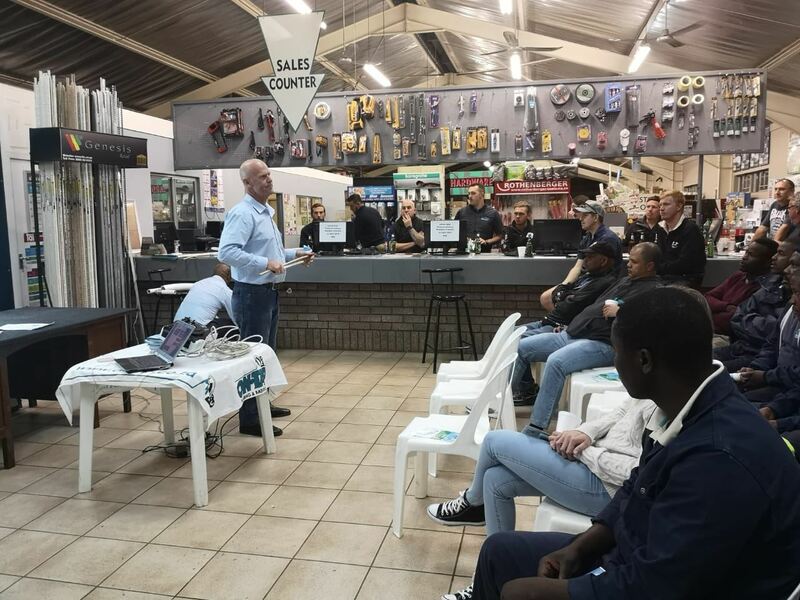 He then went into the insurance industry in 1993 and worked his way up the corporate ladder and only left in 2012 to become a qualified plumber and follow his passion. Steve is currently a licenced plumber with the PIRB, a qualified electrician as well as a licenced residential gas installer. 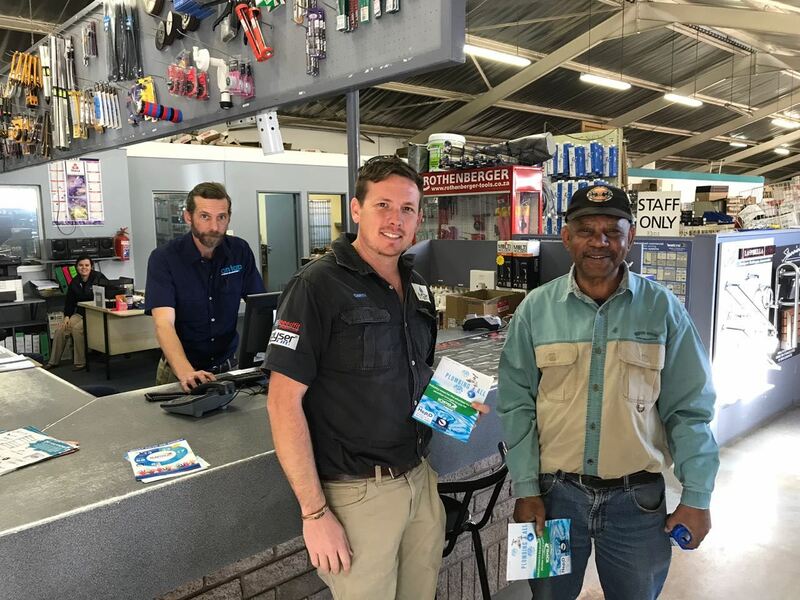 Steve joins the IOPSA family with a wealth of plumbing and industry knowledge as well as a passion for the trade. “I want to make a better tomorrow within our industry and not just uplift standards but uplift those in our trade” says Steve while speaking about his vision going forward. 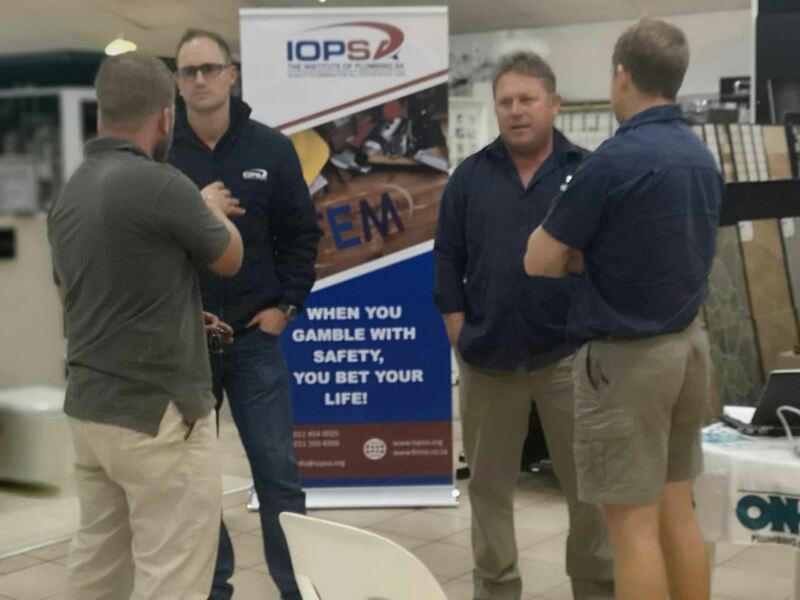 Last but not least, IOPSA would like to extend a very special thank you to Steve Brown for enthusiastically stepping in to carry the technical load for IOPSA. We ask for your continued support and enthusiasm as Steve transitions into his new role. Please join us in officially welcoming Steve to the IOPSA family. 9 ways to earn 29 CPD Points for FREE! 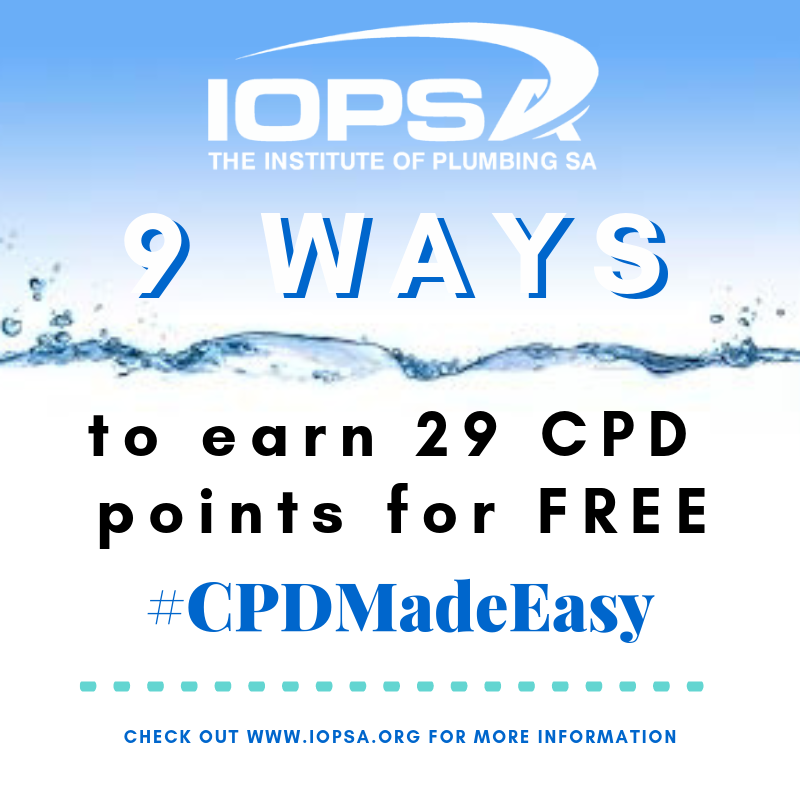 Many plumbers may find it difficult to understand the standards, and some may even believe that the standards and the required CPD point system are out to make our lives difficult but, The Institute of Plumbing SA (IOPSA) have put together a list of 9 ways to earn 29 CPD points for FREE! Watch the videos on the PIRB website = Earn 1 Credit per video (8 videos on the website) 8 Points up for grabs.